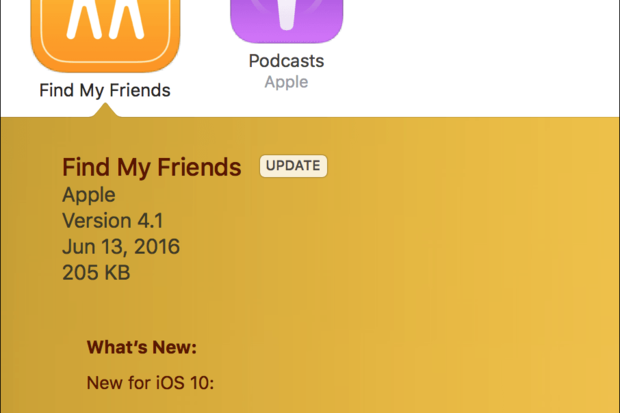 Also: Strange iOS app updates and Apple's cloud offerings. The summer is here, and lots of people want to relax and enjoy the weather. But there are still problems with iTunes that keep them from listening to their music and books in peace. In this week’s column, I look at a question about bookmarking audiobook files, help solve a problem with iTunes media on an external hard drive and an issue with app updates in iTunes, and then discuss Apple’s cloud offerings for music. 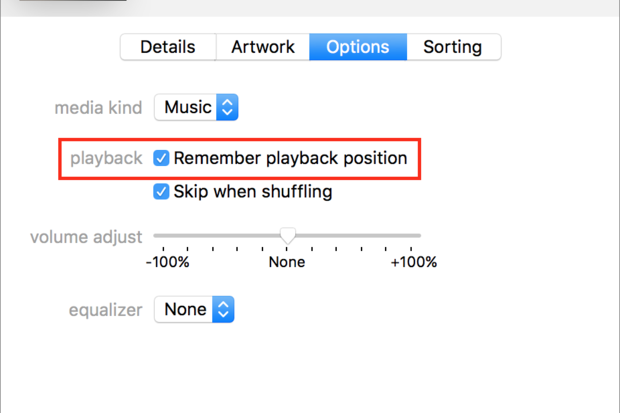 Q: Is there any way to set the Remember Playback Position option so it is on by default for all new tracks? I listen to a lot of audiobooks, and I have to manually set that option each time I add new books to my iTunes library. If iTunes could do that automatically for all new loaded files, it would make life easier. Use this option to make your audiobooks bookmarkable. This is an essential setting for listening to audiobooks. When you check this option (to access it, select a group of tracks, press Command-I, click the Options tab, then check Remember Playback Position), iTunes and iOS devices remember where you stop listening to a track. 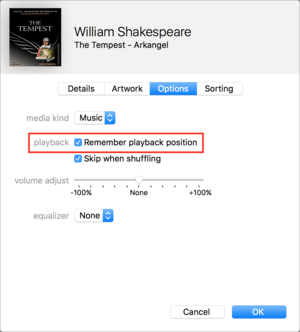 This is useful for audiobooks, so you don’t have to rewind and fast forward to remember where you left off. In addition, this position syncs between iTunes and iOS devices, so you can listen to part of a book with iTunes, then pick it up from the exact same location on your iOS device. As to it being possible to have it on by default, this would only make sense for those people whose libraries are mostly or entirely made up of audiobooks. You wouldn’t want your music tagged like this; if you stopped listening to a song, the next time it comes up, it would start up in the middle. What I would suggest is to create a playlist in iTunes (File > New > Playlist), and add all new audiobooks to this playlist. You can then select all the tracks, make the change, and delete the books from this playlist. This way, you won’t have to search your iTunes library to find your new audiobooks. Q: The iTunes app has recently started telling me that the update to the Podcasts app for iOS is only available on iOS. If I follow the instructions “To get Podcasts, search for it on the App store for your iOS device,” I don’t find it. Ditto for Find My Friends, another Apple app that now can only be updated on an iOS device. What’s going on? Yes, this happened to me as well, right after Apple released the first beta versions of iOS 10. Here’s what’s going on. These app updates are confusing. 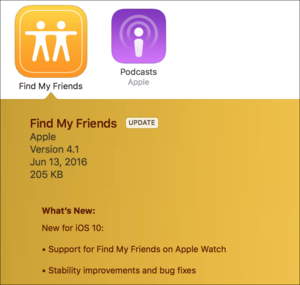 As a result of this, a couple of apps—Podcasts and Find My Friends—that were originally available separately from iOS, now show as having updates available. We are seeing this because we originally downloaded those apps when they were first available, and still have versions of them in our iTunes libraries. Other users, who didn’t download the apps, but have only used them since they were bundled with iOS, won’t see this. Just delete the apps from your iTunes library, and they won’t show as having updates any more. You can force a drive to ignore permissions in the Finder's Info window. Q: I recently moved my iTunes library from my MacBook to an external hard drive. Everything looked fine until I went to import a CD and iTunes told me it couldn’t save the files. The same thing happened when I tried adding some MP3 files. And I can’t even download music I’ve purchased from the iTunes Store. What’s going on? It sounds like a permissions issue on the external drive. Select that drive in the Finder, press Command-I, and then click the padlock at the bottom of the window and enter your password. Check Ignore Ownership on this Volume. I don’t know why this happens, but I’ve seen it off and on over the years. I’ve long used an external drive to store my media, and even if my user has read and write permissions (as you can see above), it sometimes gets stuck. I also find that, from time to time, the box gets unchecked, and I have to go back and change the setting. Q: Can I use iCloud Music Library with my iMac and iOS devices without subscribing to Apple Music or iTunes Match? I’d like to store my iTunes music in the cloud and then be able to stream it from any Apple device. No, iCloud Music Library is part of each of those subscription services; you can’t use the cloud without paying for it. If you want to have your music in the cloud, but not stream anything from Apple Music, then iTunes Match is the better deal, at only $25 a year. While there have been changes announced to iTunes Match and Apple Music, they won’t affect he availability of iTunes Match in the immediate future.